It was a weekend when all my siblings were in town visiting. My daughter was about 3 years old at the time. 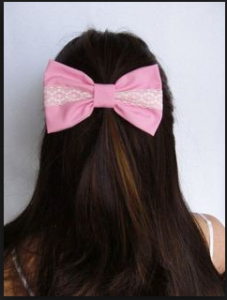 She had long curly hair which was pulled back with a barrette with a BIG PINK BOW. She was so proud of it. She loved it as it was a gift from her grandmother. I did not share her feelings of adoration for this item. Being completely truthful, I would never have purchased this item and really didn’t want me daughter to wear it. But she was in that phase of choosing her own outfits. And it was a gift from my mom who enjoyed seeing it being worn and cherished. My brother-in-law (who did not have kids at the time) asked me about the bow and why I allowed her to wear something so ugly. My response was that although I agreed with him about not liking the bow, having a battle about the big pink bow was not important to me. Brushing her teeth, saying please and thank you, showing respect – now those are things to fight with a toddler about. A big pink bow was not one of them. Several years later my brother-in-law now has a daughter, who at the time was wearing an unusual item a clothing. I don’t even remember what is was. But, he leans over to me and says “that’s my pink bow.” We both had a good laugh. This big, pink bow (and the conversation with my brother-in-law) is a constant reminder and validation for me to continue to pick my battles, not only with my daughter but for everything in life. Focus on what is important and look past the big pink bows that stay in my way.